The Money Tree Plant, also known as Pachira aquatica, is a tree that grows in the swamps of Central and South America. It can grow up to 60 ft in the wild. However, it is also a popular choice as an indoor or bonsai tree because it is easy to maintain and regulate its growth. It is a very durable plant,so it can grow in many different conditions, but the right amount of water, feeding, and light will help it grow to its full capacity. The legend which gave this plant its name says that the money tree plant will bring great wealth to its owner, and the trunks are usually braided together to "lock in" luck and fortune. Once the trunks have been braided, they will continue to grow this way, but it occasionally might need some trimming to keep it all in place. However, if you want your plant to develop fully, choose one with unplaited stems. Although this plant comes from the Americas, it is currently most popular in Taiwan. 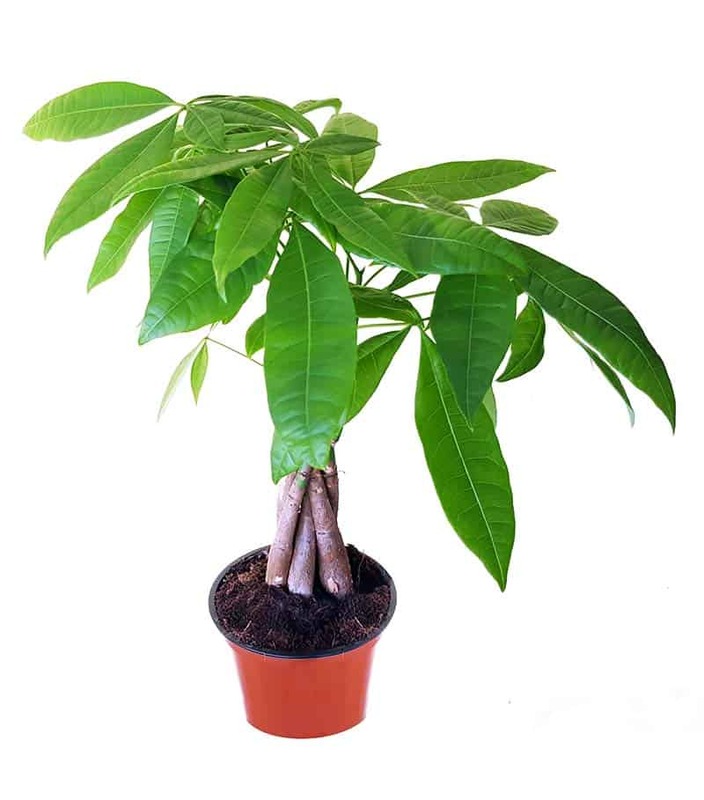 Feng shui practitioners believe that the Pachira aquatica creates "chi," positive energy that brings luck in homes, and they commonly decorate it with different ornaments to improve this ability. You can recognize the plant by its large palmate leaves, and large trees also have distinctive flowers which open like banana peels. The tree also has nuts, and they grow in green, oval pods, which are divided into five chambers inside. The leaves, flowers, and nuts are all edible. However, the nuts have a presence of cyclopropenoid fatty acids in them. Recent studies argue that CPFA are harmful to animals, but these trees have been cultivated for their nuts and eaten in the Americas for years, so there is no sign of any harm for humans. If you have a full grown tree, you'll usually know that it is time for harvest when the seed pods start falling on the ground, which indicates that they are ripe. The seed pods open when they are ready for harvesting and can be eaten raw where they taste like peanuts; or roasted, which gives them a taste similar to chestnuts. You could even grind them into baking flour or use for a hot drink. If you want to eat the young leaves or flowers, do so as you would with a regular vegetable. The bark produces a red dye, and would also be suitable for creating some handicrafts. The wood is commonly used for ropes and in building and carpentry, while seeds are used for stuffing pillows. The Money tree belongs to the Bombacoideae, a subfamily of the Malvacae family. Approximately 70 species have been discovered. They come in a shape of a small or large tree and usually have seed capsules containing many seeds. This plant needs a temperature above 60 ° F, and you can keep it both inside or outside if the temperature meets this requirement. USDA planting zones 10 and 11 have a suitable climate to grow this tree outside. Otherwise, you should grow it as a houseplant. In both cases, keep your plant out of drafty areas. A lower temperature is needed in the winter because the plant is hibernating. This plant loves moisture, but it should not stand in water because this will cause the roots to rot. Try not to wet the stems. Water once a week from spring to autumn, remove the excess water that gathers in the saucer, and let the top few inches dry off completely before you water it again. If possible for you, try to use only rainwater. If not, distilled water will also work well. You can give your plant an occasional shower, which will also remove any dust from the leaves. 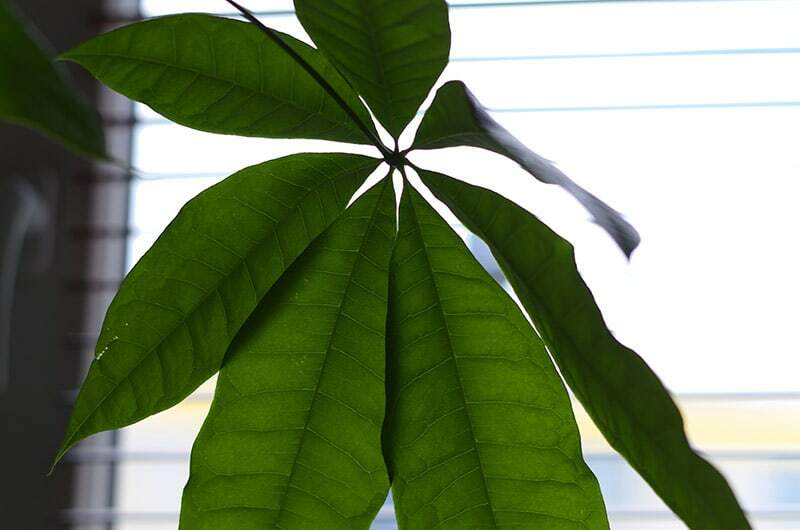 If your Pachira aquatica starts dying and dropping leaves, it commonly means you should tone down on the watering. If growth slows down in the winter, lessen the amount of water you give your plant in this period. The thicker stem at the bottom of this plant is a place where it can store water for drier days, so don't worry that it will dry out too much. The Money tree plant can endure direct sunlight, but too much will burn its leaves. So it would be best to put it in half-shade or indirect sunlight most of the time. You could also keep it in the direct sun during summer but introduce it gradually. Otherwise, the leaves could get burned. Since it grows towards the light, you should turn the plant occasionally to avoid asymmetric growth. This plant also loves fluorescent light and is a common choice for an office plant. Once you place it, avoid frequent relocating because the plant might drop its leaves as a result. Good drainage and highly nutritious substrate are necessary for this plant; the best choice would be peat moss-based soil. Regular cactus or flower soil will also work. You can add some sand or gravel to assure it drains well. Also, use a container with drainage holes. Soggy soil is the most common reason this plant dies, so don't overpot. Keeping the plant in a smaller pot will also keep it from overgrowing. You can keep your Money tree plant in hydroculture if you prefer that. The bonsai tree version of this plant needs fertilization only two or three times per year. If you want to grow the full tree, use a half-diluted liquid fertilizer every two weeks in spring and summer. You could also put some fertilizing sticks in the soil if you prefer that. Too much fertilizer could be harmful to this plant or make it grow in height without fully developing its tree crown. Lower the feeding in the winter. Although this plant will grow in lower humidity, it thrives in high humidity, meaning 50% and higher. If the air in your house is dry, especially in the winter, increase the humidity by placing some gravel and water in the saucer. You could also frequently mist the leaves to achieve this. The most common technique to breed the Money tree plant is through stem cuttings. The best time to do this is in the summer. Make 10-15 cm long cuts and place them in water or soil immediately. If you choose to place it in the water first, until the roots develop, make sure it is at least 2 cm deep. Place the water in a warm and sunny spot. After the roots grew enough, dip the ends in a rooting hormone powder if you wish, and place it in the soil. Be careful in this process because young roots are very sensitive. You can also place it directly in the soil right after the cut, but water usually gives quicker results. Breeding by seeds is less common but is simpler than cuttings. Start by soaking the seeds in water for 24 hours. Prepare a plant-based substrate in a container and place seeds evenly in the soil. Cover the seeds with about 1 cm of soil, water them, and place them in a bright and warm location. Water evenly for the whole germination process, and place them in individual pots when the seedlings grow large enough. Re-pot the plant when you buy it because it is commonly sold in too small of pots. Bear in mind, though, that small pots are the only thing stopping this plant from growing into a full tree. Afterward, re-pot only when its roots have outgrown the containers. This happens every few years, and it will keep the soil fresh and will boost the drainage. You can use a larger pot when doing this if you want your plant to grow further. Don't go overboard with this, though, because too large of pots will retain water. The best time to re-pot your plant is in the spring. When you re-pot, clear out any dry or dead roots, but make sure you don't shake the roots too much. The plant might drop some leaves, but that is normal and should not worry you. Pruning is necessary if you are growing this plant indoors, to keep it small. The plant could lose its even shape upon cutting, but it quickly resprouts after pruning, so you don't have to worry about taking off too much. Shorten the shoots and try to cut just below the leaf axil. The best time to cut the Money tree plant is in the spring. This can develop in low humidity or due to the wrong amount of fertilizer. Increase the humidity if it seems necessary and also place the plant in a permanent location. Spots in leaves are usually caused by potassium deficiency. You can cure this issue with a special fertilizer. 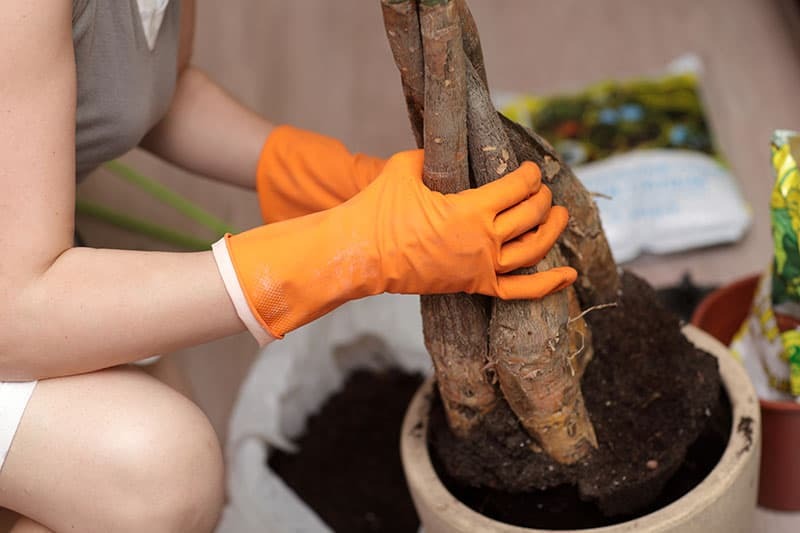 They could also happen because of overwatering, so adjust your watering habits and remove any dead leaves to stop the spreading of the disease. These are a common result of overwatering, so if you notice these, re-pot the plant in fresh and well-draining soil immediately. Cut off any dead roots in the process. Apids are a common problem if you keep your plant outside in the summer. If the infestation has just begun, you will probably be able to get rid of it by showering the plant. If this doesn't work, try using neem oil. When you see spider mites on your plants, this usually indicates that you should raise the humidity. You will see a white webbing on the stems or undersides of the leaves. Wash your plant when you notice this, and increase the humidity. They usually come in the winter and can be spotted as tiny brown bumps or by a sticky film on the leaves. You should combat scales by regularly coating your plant with a mix of water, soap, and alcohol. Why are the leaves of my Money Tree Plant getting smaller? The leaves of this plant usually shrink when it doesn't have enough light. Therefore, move it to a brighter location and increase the fertilization. Can I put my Money tree plant outside? You can put your plant outside in spring and summer months, and bring it back in when the nights get colder. Keep it in indirect sunlight though. When you place your plant outdoors, it might grow and bloom quicker. Why are the leaves of my Pachira aquatica falling off? If the healthy green leaves fall off, it might be because of too much water, and if brown or yellow leaves fall off, it usually indicates underwatering. Adjust watering accordingly; the soil should be evenly moist but not soggy. Should I grow my plant as a full tree or in its bonsai form? You can do either. It largely depends on your personal preferences and skillset. Growing a bonsai version of the plant could be a bit complicated for beginners, but you could purchase it as bonsai already and trim it regularly to keep it small. If you are not sure how to care for a bonsai tree, ask a professional for instructions. 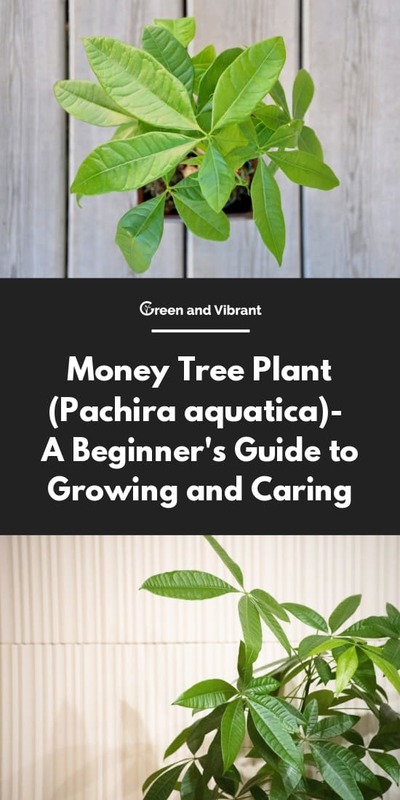 Whether you are planning to grow Pachira aquatica as a tree in your backyard or as a houseplant, you won't be sorry. It is easy to maintain and will be a great addition to every gardener's collection. It will give your home a tropical feel, and who knows, maybe it will also bring you some fortune!